Log on to Internet Banking and select 'Other Services > Using My Card Abroad' from the main menu. Then click the'Register Trip Abroad' button and complete the SecureCard form. You can only register one trip at a time. Inputting a second trip before the first one ends will cancel the first trip and your card won’t work as expected. Please wait until the first trip ends before entering another trip. You can also use our Mobile Banking app to register your card for use abroad. 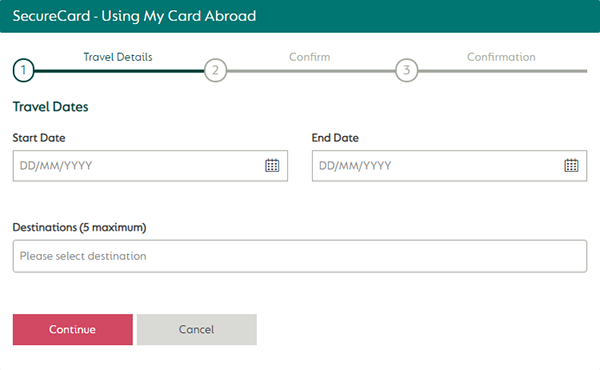 Select 'Using My Card Abroad' from the main menu and follow the instructions. If you're not registered for Internet Banking, please call our Customer Service Team on 01228 403 141 to register your card for use abroad. Alternatively, pop into your nearest branch and a member of our team will be happy to help you. Read more about charges, conversion rates and other FAQs.